Description: Sexes similar. 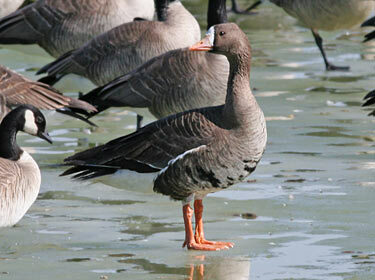 Adult mainly grayish-brown, with large white patch on face and pinkish or orange bill; legs and feet orange; belly variably barred with black; undertail coverts white. 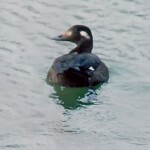 Immature similar but lack white face and black bars on belly. 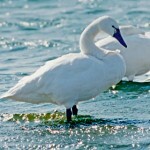 Habitat: Large marshes, shallow lakes, wide rivers with bars and islands, and adjacent grain fields. 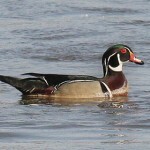 Where in Nebraska: Rare regular summer and winter visitor in central and western Nebraska. An abundant regular spring and fall migrant in the central portion of Nebraska, a common migrant east. Migrating flocks, numbering up to 1 million birds, travel through the central part of Nebraska in spring, generally in the Rainwater Basin and along the central Platte River. Fun Facts: Greater White-fronted Geese form bonds with parents, offspring, and siblings that last longer than most goose species. Parent and sibling bonds may last their entire lives.